What do you think of my purple shirt? If you like it, join the crowd. I haven’t owned a piece of clothing that has drawn so many positive comments since I dressed in the style of the 1960s and early 1970s and looked at least a tad like a hippie. My wife and I walk two miles together four days a week, and I walk by myself one additional day when she’s not available. One of my advantages in being retired is I can walk any time. We prefer walking in the neighborhood because we can give our miniature dachshund a good workout. Those short little legs seem to do well with the two times around the loop that adds up to two miles. But the weather doesn’t always cooperate. Sometimes it’s too hot or too cold, windy, rainy, or snowy. Other times we just need a change of scenery. So it’s off to the local mall—one mile up the road. We see quite a variety of stores in our trek around the mall, but one that invariably catches my attention is the Harold Pener Man of Fashion store. 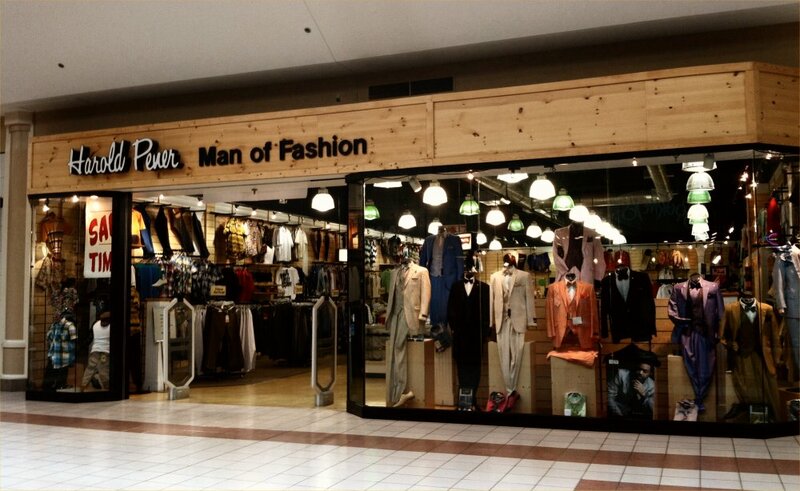 If you’re not familiar with it, Man of Fashion is a predominantly black (African/American if you prefer) store. Not only do they have the most interesting clothes on display in the window, they use a small kiosk that’s out in the center of that part of the mall to model additional menswear. Many months ago I noticed the purple shirt in the window. I made the mistake of falling in love with it. I’d been inside Harold Pener a time or two, so I knew it wouldn’t be cheap. Nonetheless, after passing it several more times that week and drooling a little more each time, I mentioned it to my wife. That doesn’t mean she likes to torture me, though, and she’s quite unselfish. So the next time she walked the mall with me, I pointed the purple shirt out, and she offered to go inside and take a closer look. So far, so good. Better than I’d expected, in fact. Whoops! They didn’t have that shirt in my size. Not the purple one. They did have the same pattern in three or four other colors, several of which were almost good enough. But almost doesn’t cut it. Not at $40. While we were looking at the other colors, our enterprising salesperson decided to check the shirt in the window. YES! My size. Medium. When we reached the register, I smiled and said, “Not right for you folks to have all the good fashion.” While I wouldn’t recommend just any white person saying that, I do get away with a few things at sixty-seven I wouldn’t even have thought to do when I was younger. Anyhow, we all laughed at my comment, and we had a good conversation. You know, I”ll bet a number of white men would feel funny going into Harold Pener, but not me. I was a (potentially) paying customer, not simply a fellow of a different race. I really appreciate the fact I felt so comfortable there, and I always wave when I pass by, whether I see anyone looking or not. I still see things I like in the window, but we can’t afford to have me stray from the budget that way very often. 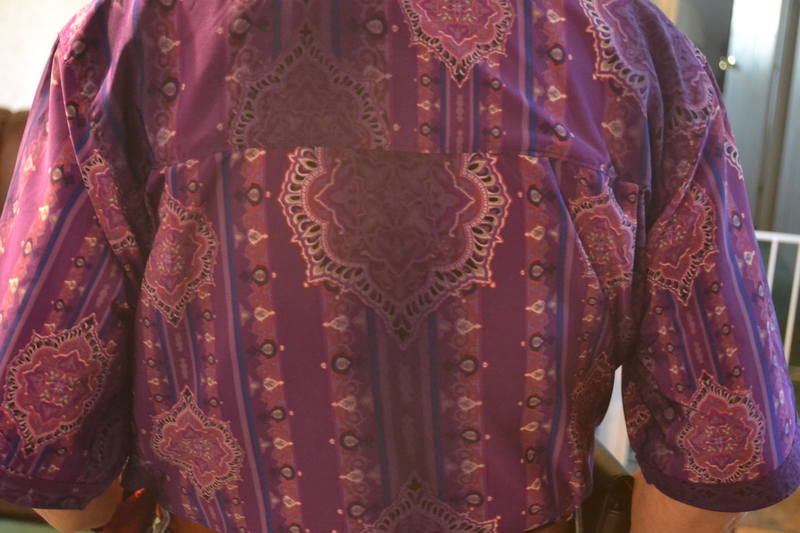 So I view my purple shirt not just as a fine, favorite piece of clothing, but as a symbol of good race relations. 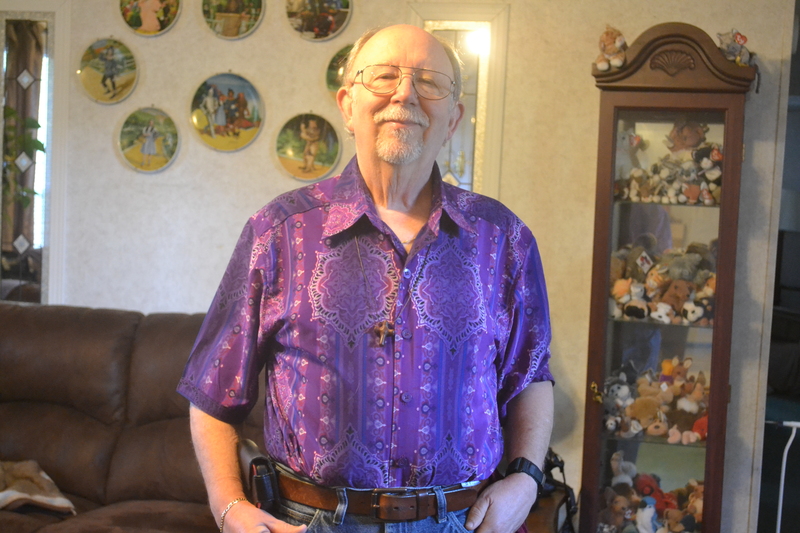 This entry was posted in African/American, Black, Harold Pener, Purple, Race, Uncategorized and tagged As I Come Singing, Harold Pener, On Aging Gracelessly, Purple Shirt, Race Relations, Roger E. Bruner. Bookmark the permalink. I certainly can’t blame you for feeling that way, Tom. The color doesn’t have anything to do with who I like or dislike. It’s definitely the person…the individual. Hmm. I hope you didn’t associate me with what I consider the more objectionable aspects of hippydom–I didn’t even drink alcohol (still don’t), but less use drugs (which, of course, I still don’t).